The newly appointed Chief of Staff to H.E Gov. Ibrahim Gaidam, Alhaji Muhammad Nur Alkali has formally taken office today. 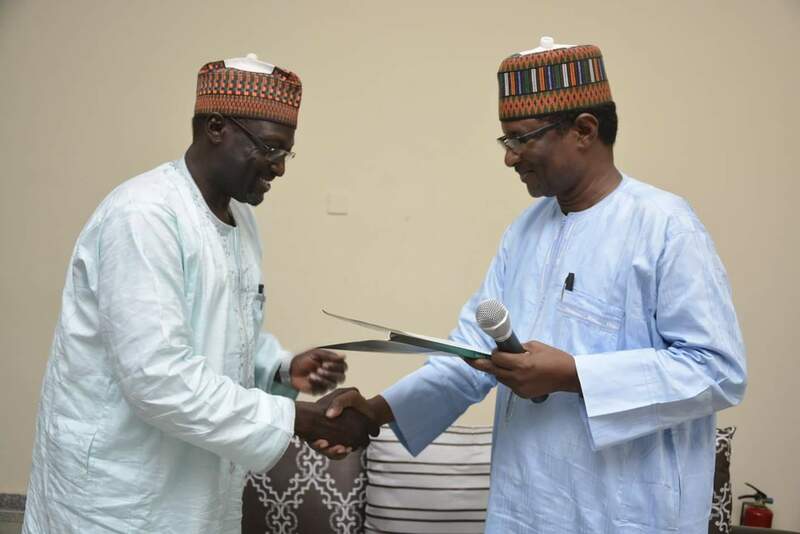 In a brief ceremony attended by all senior Government House personnel, the former Chief of Staff and current Head of the Civil Service, Alhaji Saleh Abubakar said the new COS is a humble, humane and hard working public servant. “I have known Muhammad Nur Alkali for over 30 years. His Excellency has made the right choice in appointing him. He is humble, humane and hard working. I hope that all of you who helped me to succeed as Chief of Staff for ten years will work together with him to advance the cause of the administration, and ensure that His Excellency continues to achieve his objective of moving our state forward”, he said. Alhaji Saleh Abubakar lauded the close cooperation and sense of camaraderie that characterised senior personnel interactions within the Government House while he was COS, saying he will continue to cherish those memories for a long time. The new Chief of Staff Muhammad Nur Alkali thanked the Head of Service for the COS Briefs he provided. He said he will study and be guided by them. Alkali thanked H.E Gov. Gaidam for the appointment. “I am grateful to His Excellency for finding me worthy for the appointment. I pledge to do my best to serve him. I am confident that I will work with all of you to make His Excellency accomplish all the tasks before him. I believe in team work. Let’s work as a team”, he said. The PHOTOS below, captured by GH Chief of Photography Hassan Muhammad, are from the brief ceremony at the office of the COS earlier today. IGP inaugurates new police command headquarters in Lafia.